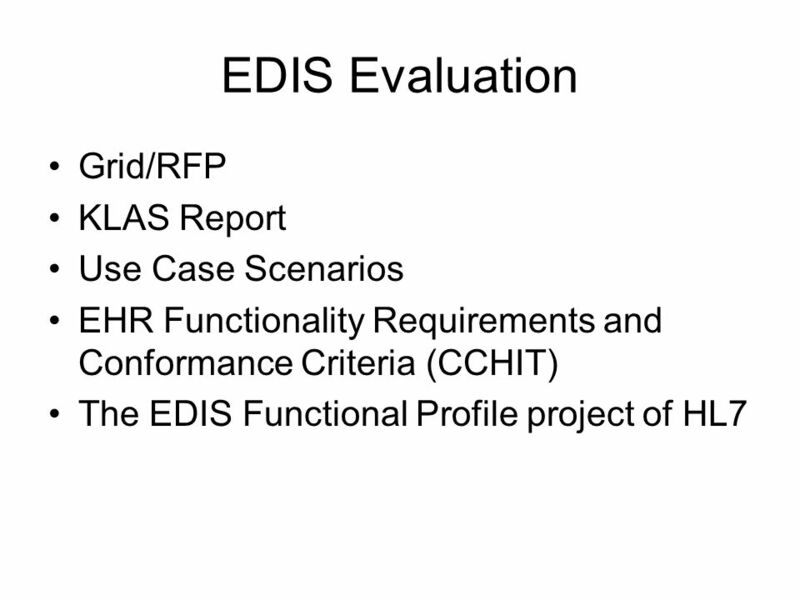 Test Driving: Model Cases and EDIS Evaluation Todd Rothenhaus, MD FACEP Chief Medical Information Officer Caritas Christi Health Care System Attending. 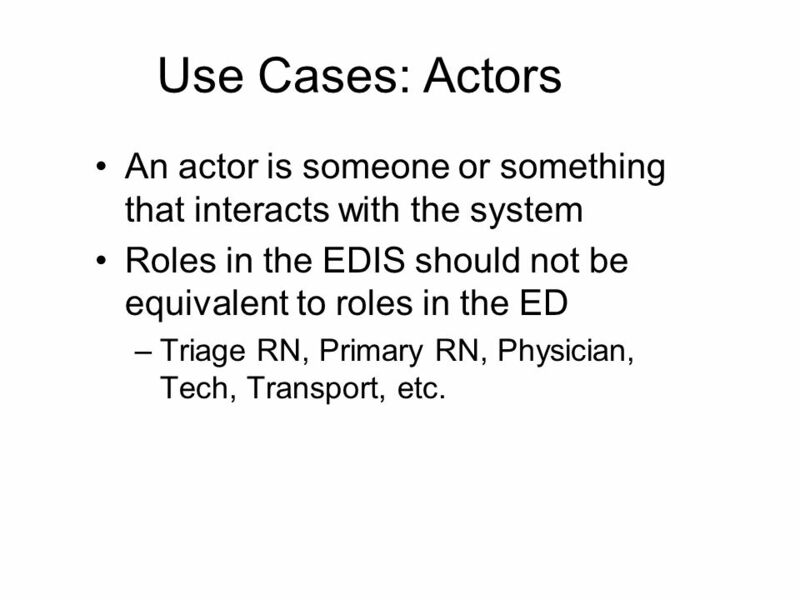 11 Use Cases: Actors An actor is someone or something that interacts with the system Roles in the EDIS should not be equivalent to roles in the ED –Triage RN, Primary RN, Physician, Tech, Transport, etc. 12 loose coupling Coupling is the dependency between interacting systems. This dependency can be decomposed into real and artificial dependency: –Real dependency is the set of features or services that a system consumes from another system. Real dependency always exists and cannot be reduced. 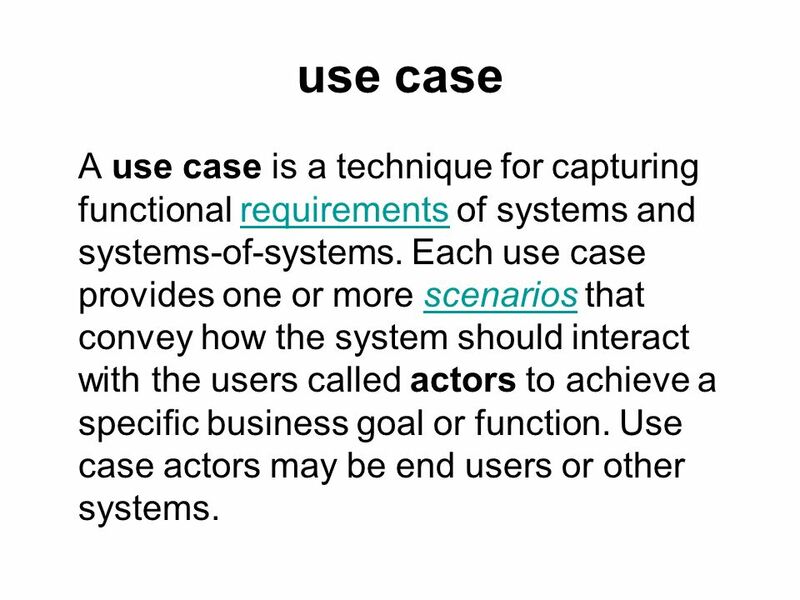 –Artificial dependency is the set of factors that a system has to comply with in order to consume the features or services provided by other systems. Artificial dependency always exists, but it or its cost can be reduced. 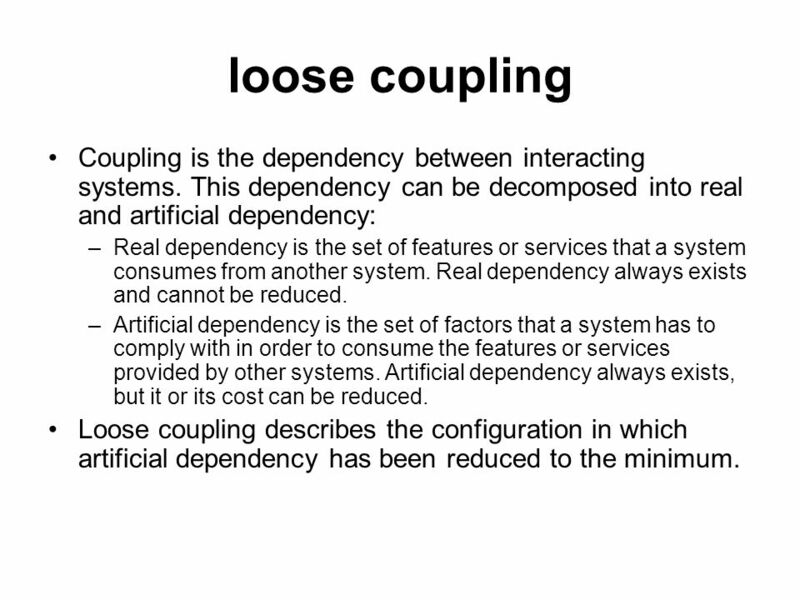 Loose coupling describes the configuration in which artificial dependency has been reduced to the minimum. 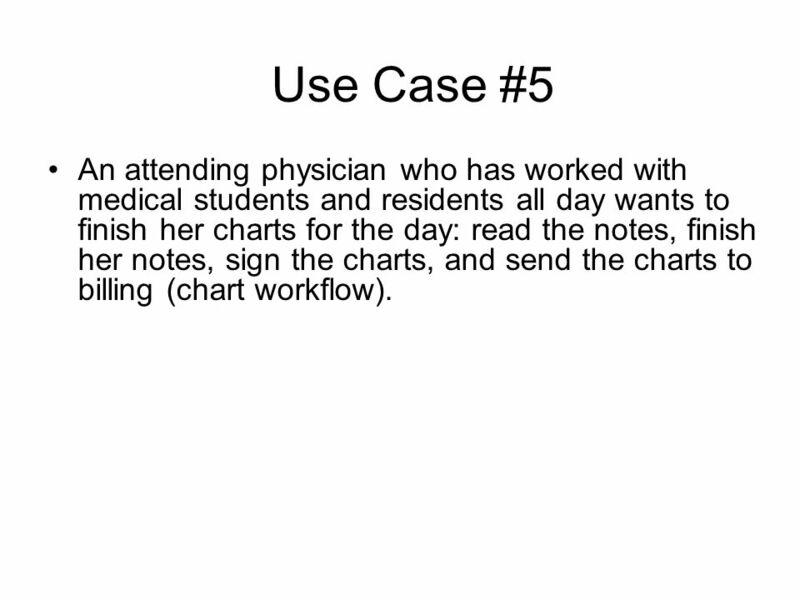 18 Use Case #5 An attending physician who has worked with medical students and residents all day wants to finish her charts for the day: read the notes, finish her notes, sign the charts, and send the charts to billing (chart workflow). 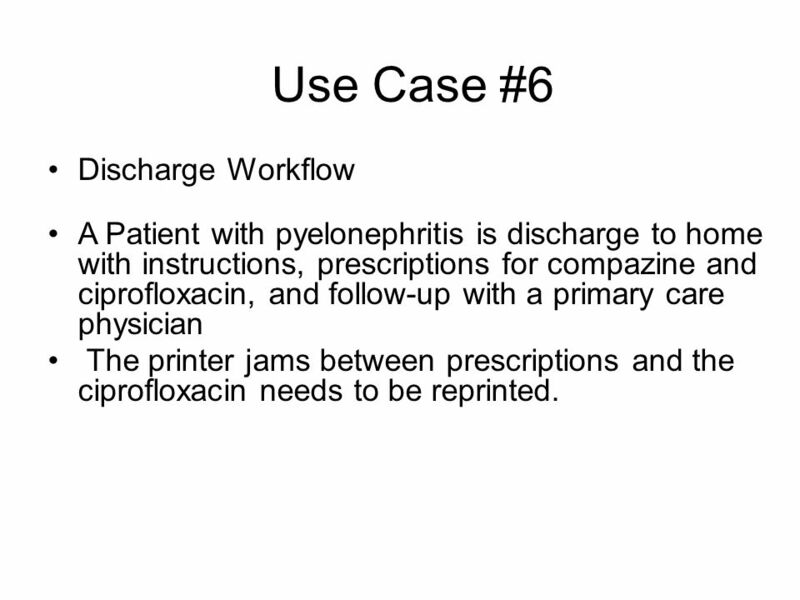 19 Use Case #6 Discharge Workflow A Patient with pyelonephritis is discharge to home with instructions, prescriptions for compazine and ciprofloxacin, and follow-up with a primary care physician The printer jams between prescriptions and the ciprofloxacin needs to be reprinted. 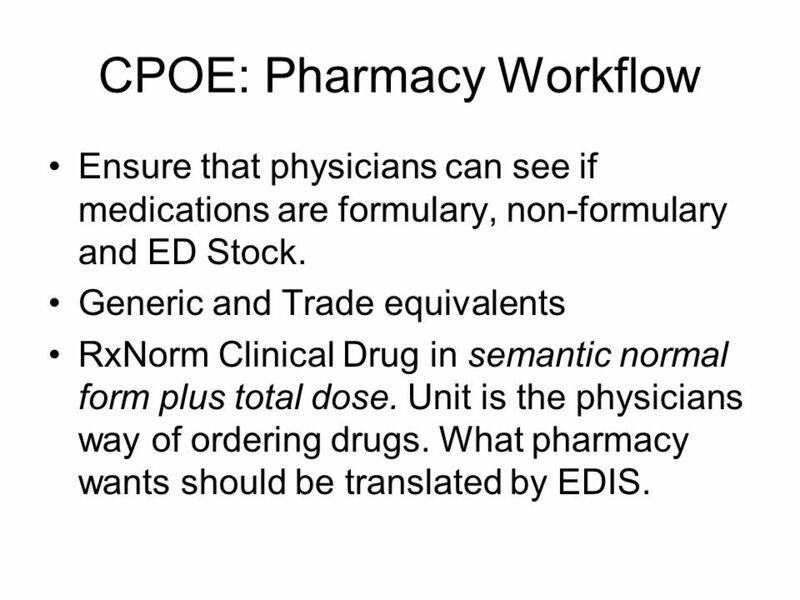 23 CPOE: Pharmacy Workflow Ensure that physicians can see if medications are formulary, non-formulary and ED Stock. 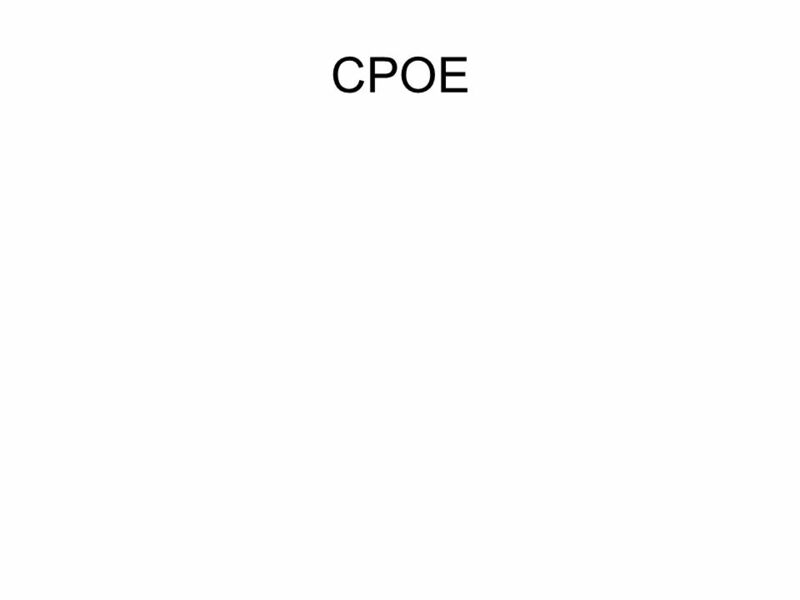 Generic and Trade equivalents RxNorm Clinical Drug in semantic normal form plus total dose. Unit is the physicians way of ordering drugs. 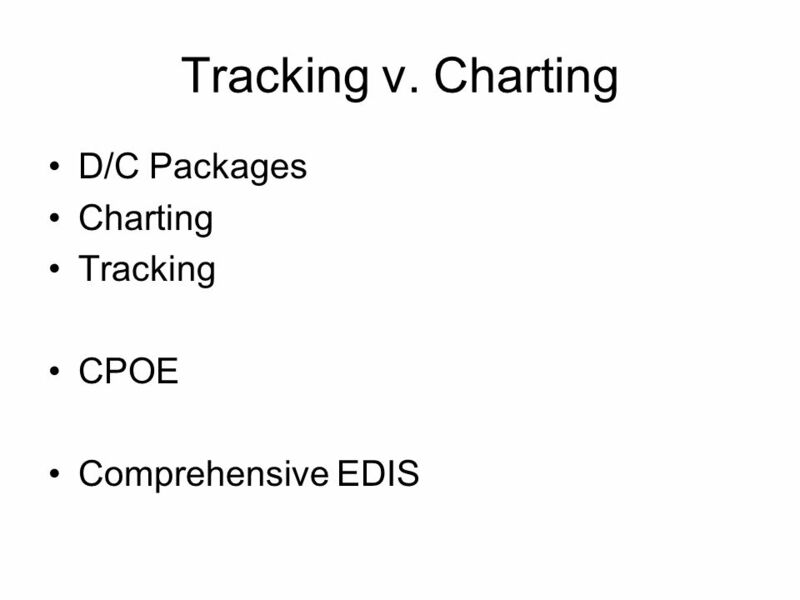 What pharmacy wants should be translated by EDIS. 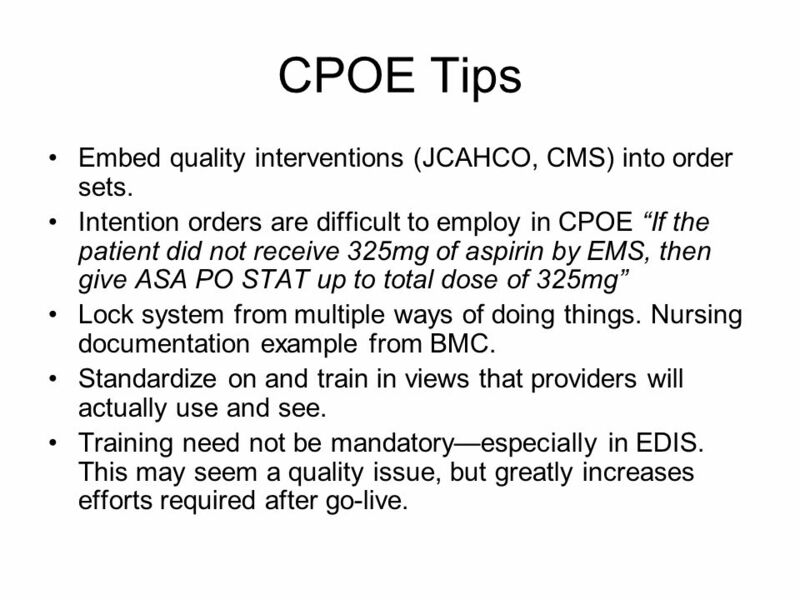 24 CPOE Tips Embed quality interventions (JCAHCO, CMS) into order sets. 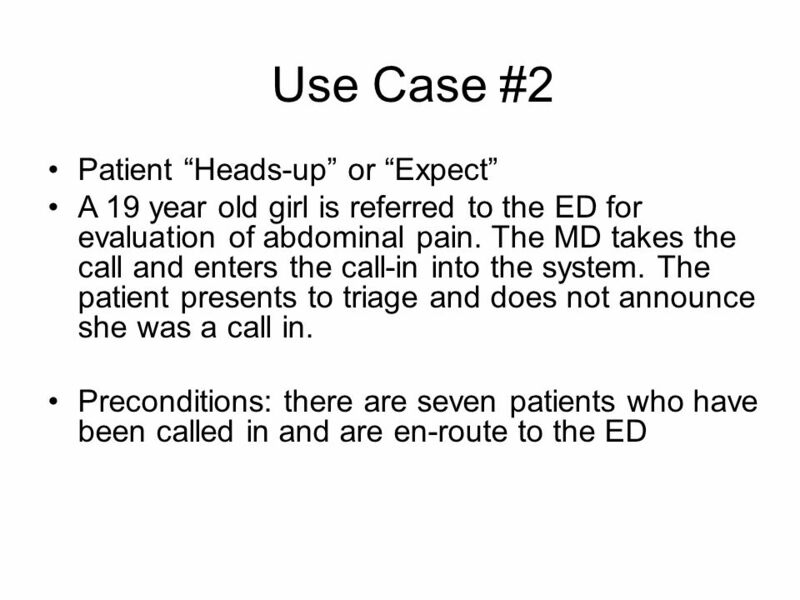 Intention orders are difficult to employ in CPOE If the patient did not receive 325mg of aspirin by EMS, then give ASA PO STAT up to total dose of 325mg Lock system from multiple ways of doing things. 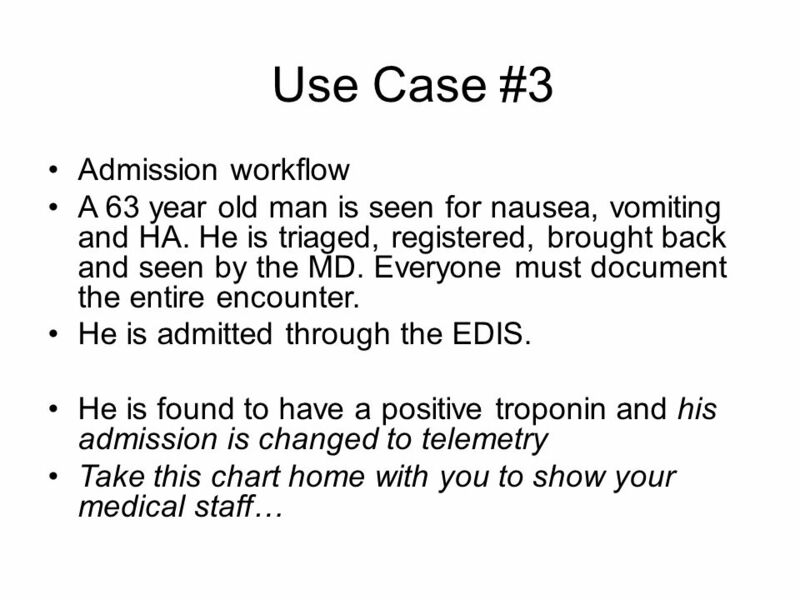 Nursing documentation example from BMC. 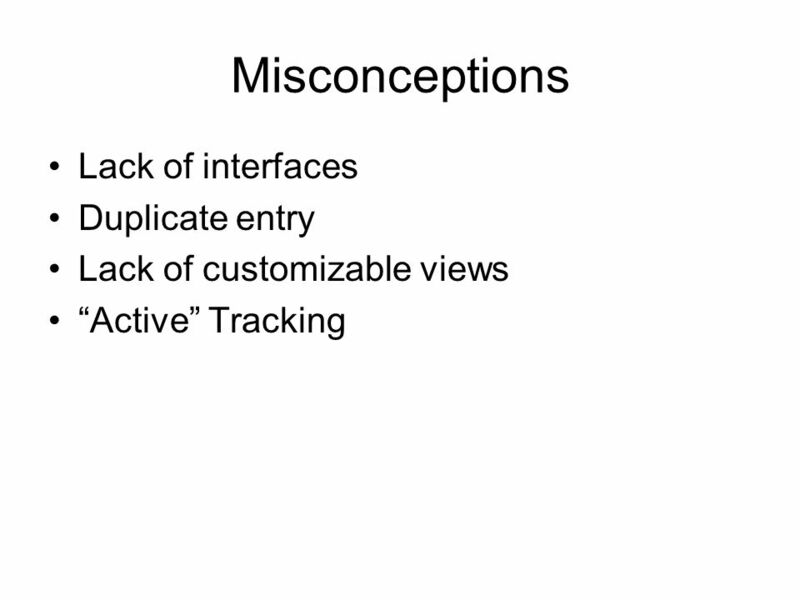 Standardize on and train in views that providers will actually use and see. 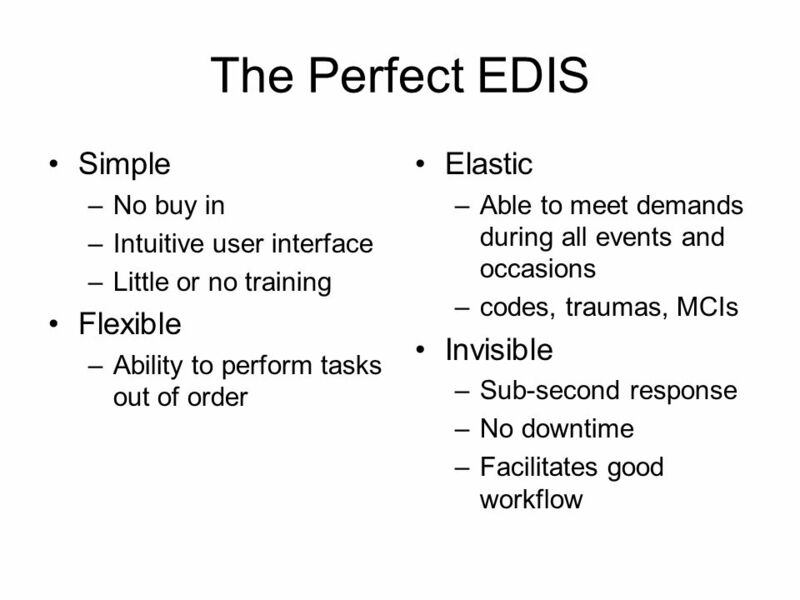 Training need not be mandatoryespecially in EDIS. 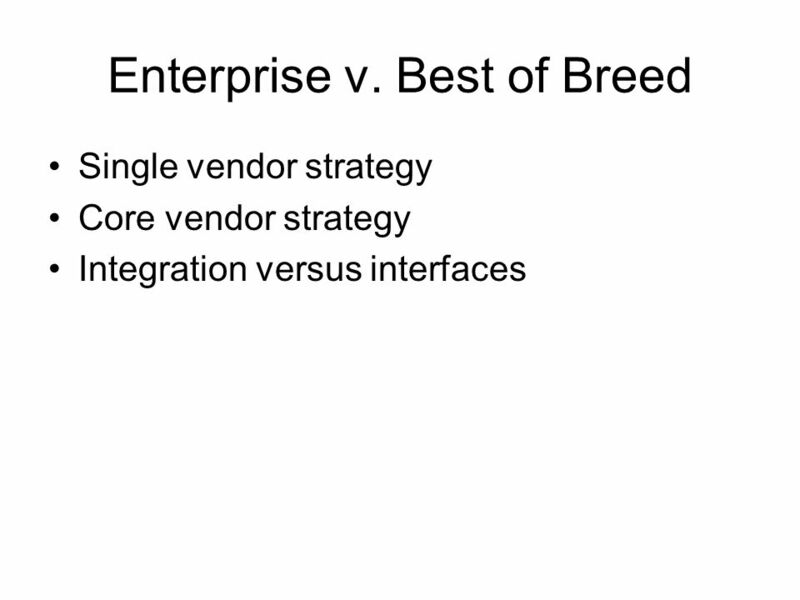 This may seem a quality issue, but greatly increases efforts required after go-live. 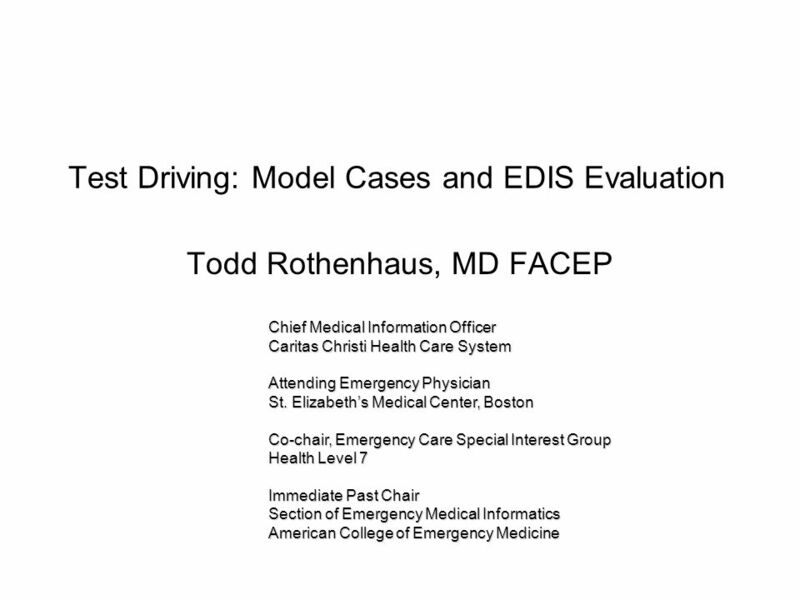 Download ppt "Test Driving: Model Cases and EDIS Evaluation Todd Rothenhaus, MD FACEP Chief Medical Information Officer Caritas Christi Health Care System Attending." 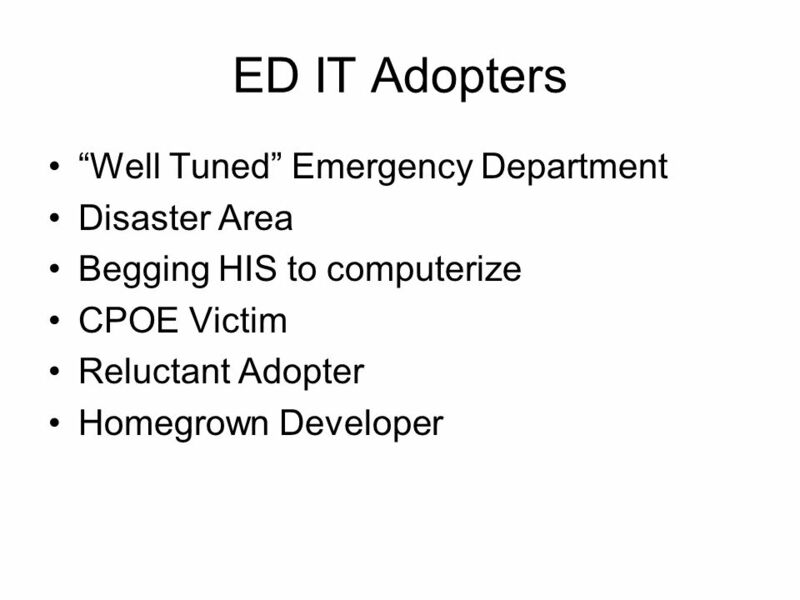 September, 2005What IHE Delivers 1 Todd Rothenhaus, MD FACEP American College of Emergency Physicians Emergency Department Referral. Development of Order Sets Vicki Moritz, June 2005. Please wait……….. CHAPTER 12 AUTOMATED DISPENSING CABINETS (ADCs) - is a computerized point-of-use medication management system that is designed to replace. 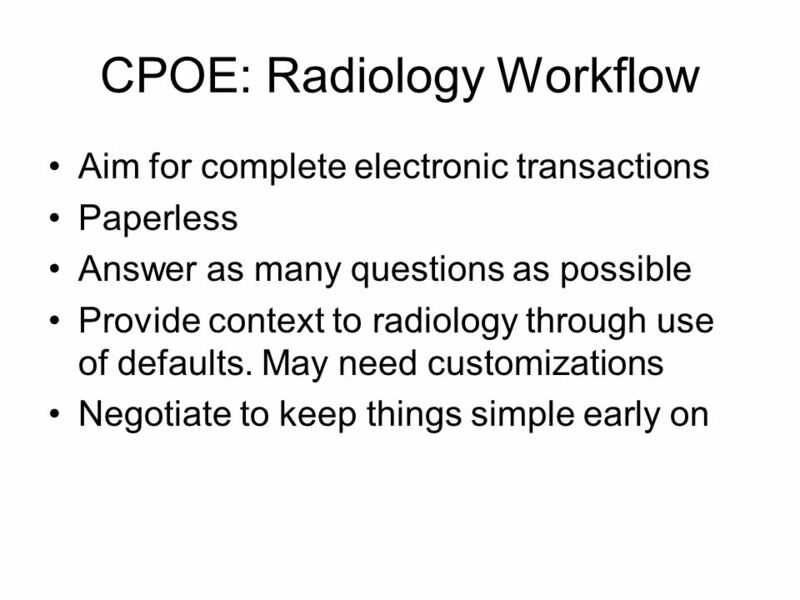 Introduction to Medical Informatics Physician Office Workflows COMMON WORKFLOW CHALLENGES PHYSICIAN OFFICE. What IMPACT Means to Physicians November 2014 Physician Champion: William Bradshaw, MD, FACS. 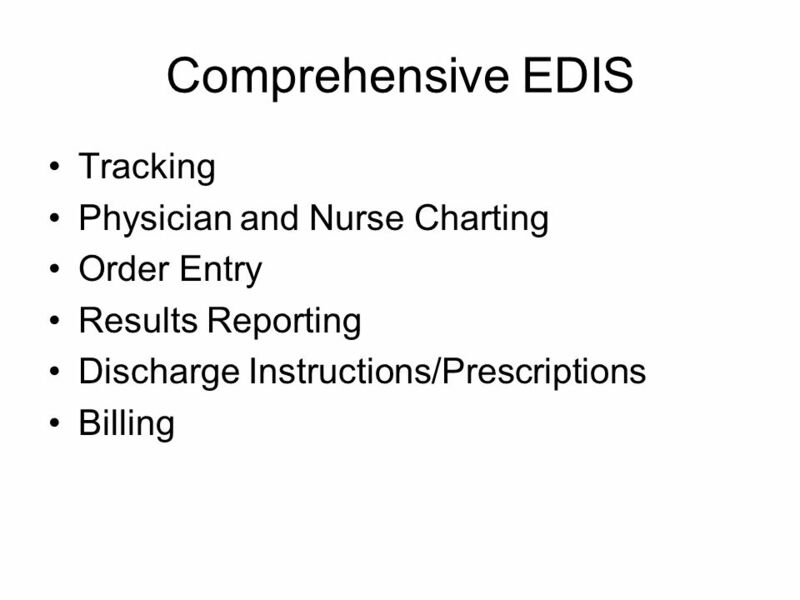 Electronic Medical Records in the Emergency Department The downsides… Neal Chawla, MD Dept of Emergency Medicine INOVA Fairfax Hospital. 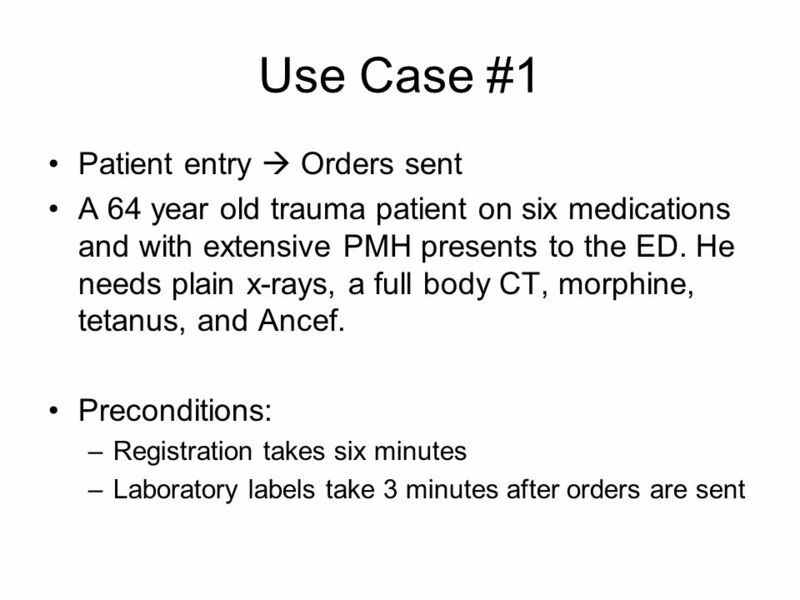 Innovations in Process Management/Optimizing Patient Management Leslie S. Zun, MD, MBA, FAAEM Chairman & Professor Department of Emergency Medicine Chicago. 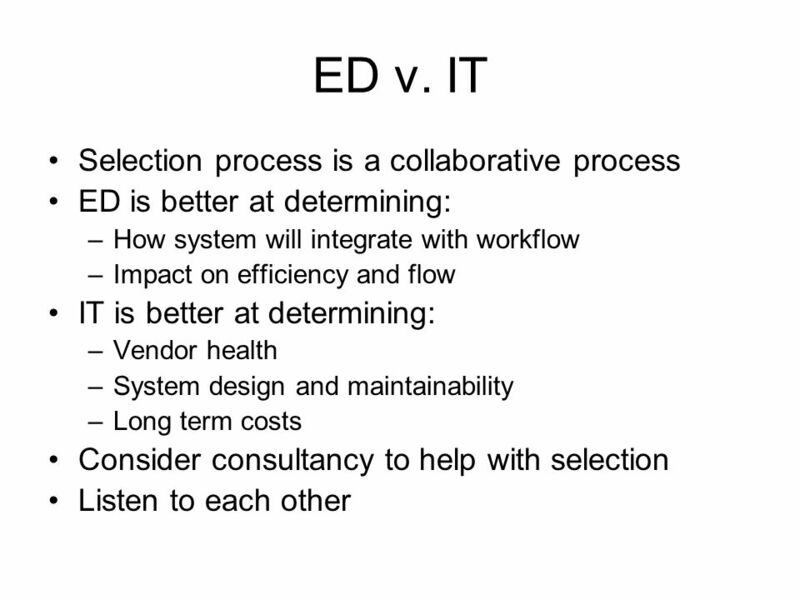 2 The Use of Health Information Technology in Physician Practices. 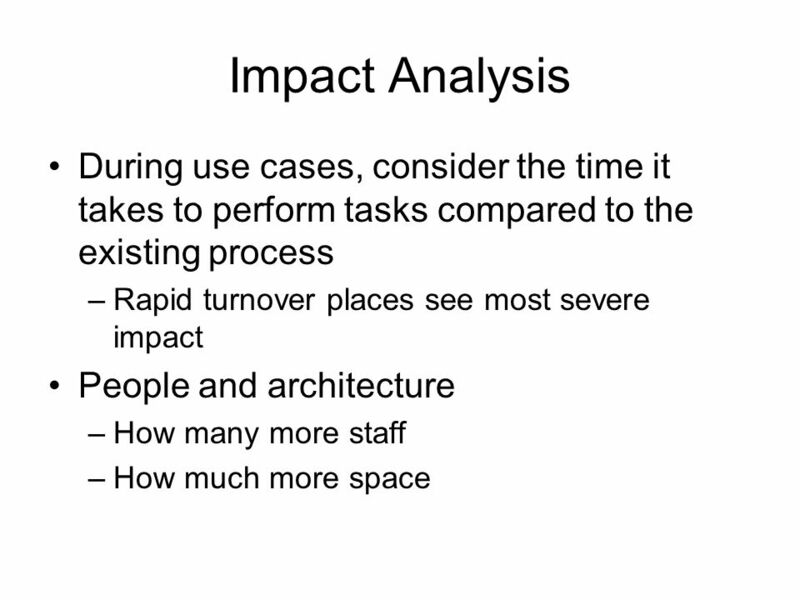 Clinical Information System Implementation Project Prepared for Clinical Affairs Committee December 4, 2002. 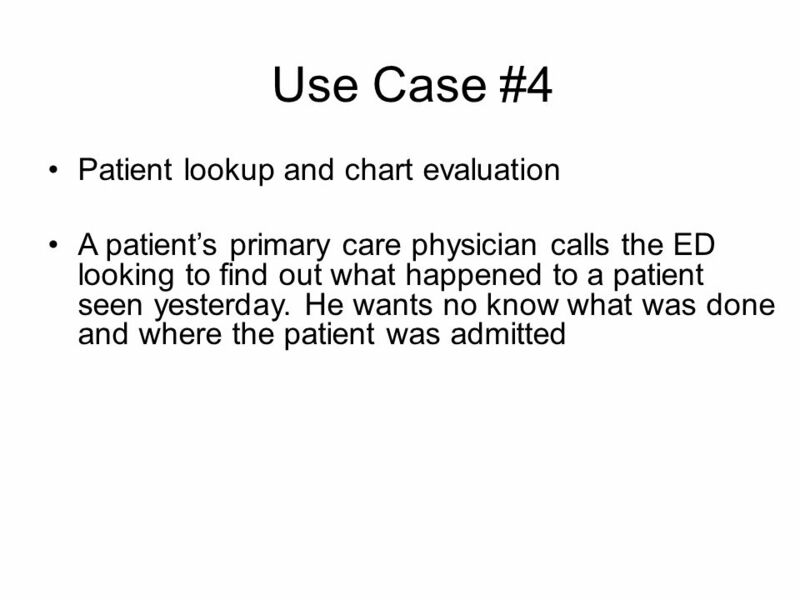 ICU Clinical Information Management System An Investigation for a Pediatric Intensive Care Unit Steven Sousa Ann Thompson. Medication History: Keeping our patients safe. How do we get all of the correct details? 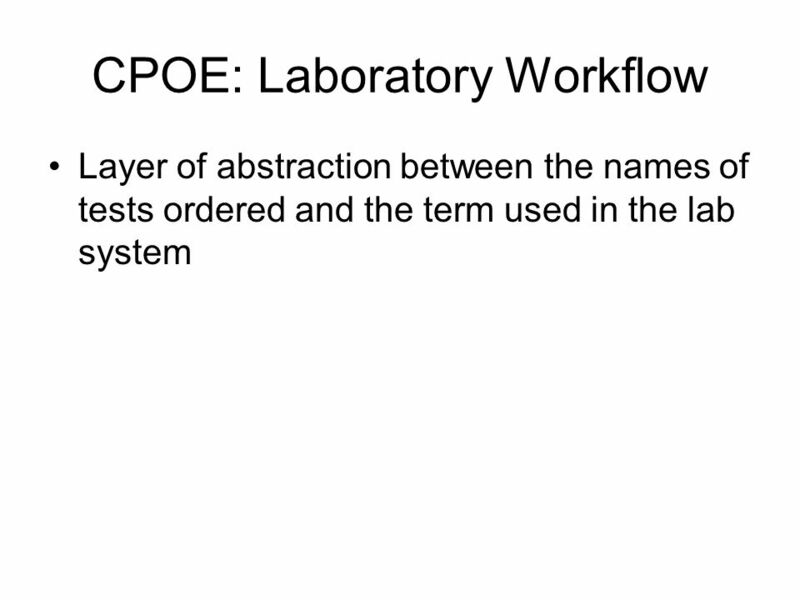 Unit 7.2: Work Process Flow Chart Safe Workflow Design 1Component 12/Unit #7 Health IT Workforce Curriculum Version 1.0/Fall 2010.